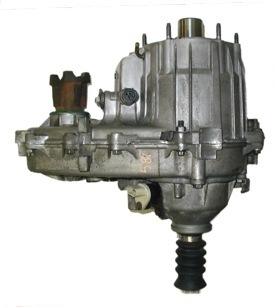 The Jeep NP242 transfer case was introduced in the 1987 model year as a replacement for the NP228. The 242 premiered in the XJ Cherokee / Wagoneer and MJ Commache as the SelecTrac option. 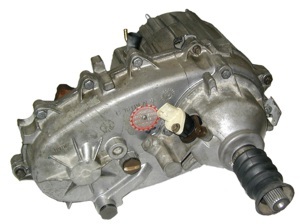 It was used in the 1991-1998 ZJ Grand Cherokee. The 242 persisted throughout the full run of XJ Cherokees and continued on in the 2002 KJ Liberty. The 242 was originally tagged as the 242AMC, and as ownership of AMC was taken over by Chrysler, it was later designated as the 242J. This transfer case was later called the NVG (New Venture Gear) 242. Despite the different nomenclature, very few mechanical changes were required or made throughout their production span. 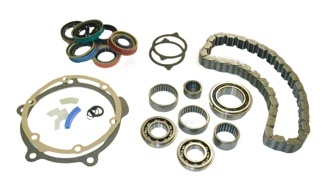 Earlier attempts at torque-biasing transfer cases were spotty in their success, beginning with the QuadraTrac in the 1970's and continuing with the NP219 and NP228. The 242 has continued in the trend of chain-driven cases and has technically and commercially been more successful than its predecessors. 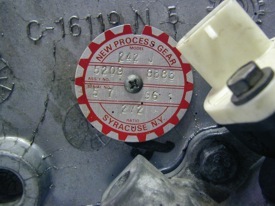 This tag indicates a 242J transfer case, with a part number of 52098886, a build date of 5-7-96 and a gear ratio of 2.72:1. Though Full-Time is the nomenclature used, this is a position that is used sparingly, as component wear throughout the geartrain and tires is a result, in addition to decreased fuel-efficiency. Early 242s from 1988 through 1991 featured a conventional mechanical (cable) drive speedometer output. In 1992, Jeep introduced a three-wire, digital square wave Vehicle Speed Sensor (VSS), in the vein of modern automotive systems. The design of the 242 is fairly good. They were engineered for durability and simplicity of build - both an advantage to the OEM assemblers as well as individuals servicing them. The NP242 transfer case has turned out to be stronger than expected. Most of our customers choose to retain their Jeep 242 with their conversions. It is very common for them to offer good service behind some of the strongest engines and transmissions. The 242 weighs about 85 lbs. This transfer case is identified by its red and silver tag on the rear of the case. They are also easily identified by appearance. They feature a six-bolt front face and a longitudinally ribbed barrel case. There is a GM version of the 242 as used in the H1 Hummer (1992-2006) and the later H2 (2003-2009). It features a front face six-bolt pattern that is compatible with the Jeep six-bolt styles. This GM version is rated at a stronger duty by virtue of its heavy duty 32 spline input and output shaft, a 6 pinion differential and a 1.25" wide chain. It also features an integrated cooler. Interestingly, New Venture documents show the 242 as being rated at 1486 ft. lbs. of torque. This is probably determined based on Full-Time position usage. Experience would say that this is a very conservative number for all other positions. 242's have a variety of factory shifter mechanisms. Essentially all of them are clunky and problematic "Z-gate" shifters. Their convoluted linkage systems can be entirely replaced with Novak kit #SK2X, our smooth shifting, universal shifter. 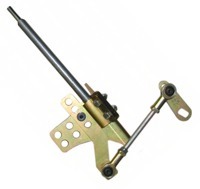 This shifter assembly also simplifies the upgrade to the above transmissions. The 242 is possibly the simplest of all the Jeep transfer cases to rebuild. Their assembly is intuitive, and parts are easily available and affordable. The important variations to look for in the 242 transfer case are in the input gear. The 242 comes in 21 spline and 23 spline versions with long, medium (rare) and short variations. We have documented these gears here. NP242 speedometer gears are interchangeable to correct for tire size and axle ratio changes. See this page to learn more about this.